It’s that time in the season of “The Bachelor” again where most of the women who ever had a beef with their suitor get to lay it all out on the line with ‘The Women Tell All episode. Some of the 18 women from this season to return in this episode are Bekah M., Bibiana, Chelsea, Jacqueline, Krystal, Seinne and Tia. Pictured: The Bachelor Arie Luyendyk Jr. with host Chris Harrison. “The Bachelor” season 22, Arie Luyendyk Jr. stated earlier in the season during an interview that he fell in love with more than one woman on the show. In the finale trailer, he in fact did the Ben Higgins mistake where he tells not TWO women that he “loves” them. But, ALL THREE! Yikes! Can’t wait to see how this pans out. 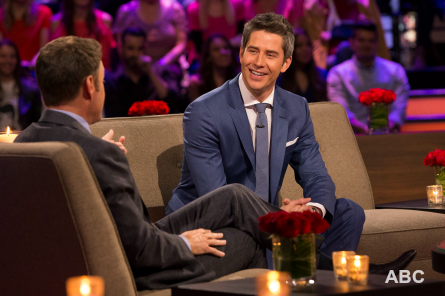 Before that, Arie takes a trip down “The Bachelor” season 22 memory lane on the traditional vent fest ‘Women Tell All episode which airs Sunday, February 25th (8:00-10:00 p.m. EST) on ABC. 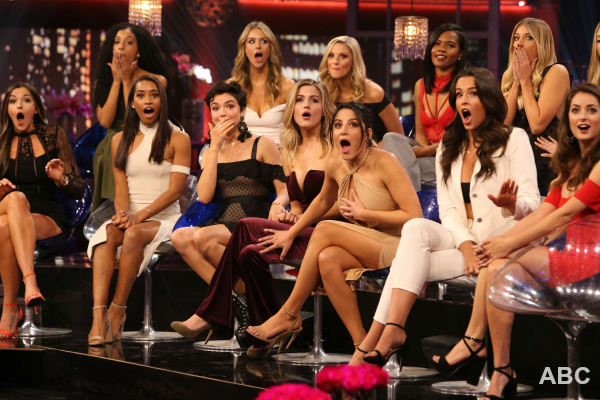 Taking the hot seat will be Bekah M., Sienne, Tia, and of course the woman labeled as the “villain” this season Krystal who receives much backlash from the other 17 women on the panel. Viewers will be treated to a never-before-aired clip of a little bit of what happened at the bowling alley after Arie changed his mind about treating not only the winning team, but also the losing team to an after-party. Viewers will remember that’s when Krystal (a member of the winning team) lost it and all hell broke loose. The women especially got to see a whole other side to Krystal that was even more unpleasant than her usual miserable self. But, what viewers really want to see is footage from that notorious bus ride back to the hotel!! Apparently, during the ‘Women Tell All episode, Krystal breaks-down and talks about dealing with her homeless brother. During Sienne’s time in the hot seat, she’ll talk about what she thinks went wrong with her and Arie’s courtship. Then, Tia, who’s friends with runner-up of Nick Viall’s season Raven, will talk about how blind-sided she was when Arie sent her home during the Rose Ceremony last week (after the hometown dates). THE BACHELOR 22 WEEK 8 HOMETOWN DATES RECAP HERE! When Arie takes the hot seat, he’ll be confronted by Caroline, and Krystal, two of many who seek closure from Arie. In Monday’s finale episode of “The Bachelor”, Arie and the remaining three women – Lauren B., Becca K., and Kendall will continue their romance in Peru where they’ll kick-off the overnight dates. We’ll also finally get to see which girl’s ex-boyfriend shows-up to put a damper on things. “The Bachelor” overnight dates in Peru air this Monday, February 26th. “The Bachelor” season 22 finale airs Monday, March 5th (8:00-10:00 p.m. EST) on ABC.